T etrachloroethene (pronounced tet'ra klor'o eth-een), or PCE, is a manufactured chlorinated organic compound used in chemical manufacturing and as a solvent by automotive repair shops, paint shops, machine shops, service stations, and dry cleaning establishments. It is also used in some consumer products. PCE is also commonly referred to as tetrachloroethylene, perchloroethylene, and PERC. 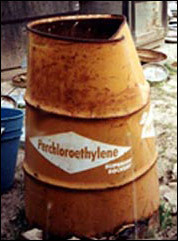 At room temperature, PCE is a nonflammable liquid, and its extensive use from the 1940s through the 1980s had much to do with it being much safer than other flammable solvents. PCE use has decreased since the 1980s because of increased efficiencies in the industrial processes where PCE is used, concerns over environmental impacts, and availability of alternative solvents. Currently, dry cleaning businesses and chemical manufacturers are the primary users of PCE. Please read our factsheet on the safe use of PCE and chlorinated solvents as well as our letter to business and property owners regarding hazardous material use. PCE contamination of groundwater is a problem throughout the American West. The major source of PCE in drinking water is discharge from industrial facilities and dry cleaners. The presence of PCE in groundwater can affect both local drinking water supplies and construction projects where dewatering is required. The Agency for Toxic Substances and Disease Registry provides information on some of the health questions about PCE including its link to cancer. The World Health Organization's International Agency for Research on Cancer also considers PCE a probable human carcinogen. While irritation may result from repeated or extended skin contact with PCE-containing products, ingestion and inhalation can cause dizziness, headache, sleepiness, confusion, nausea, difficulty speaking or walking, unconsciousness, and (in extreme cases) death. Fabrics treated with PCE-using dry cleaning equipment can release small amounts of PCE vapors which can be inhaled. Use of solvents or degreasing agents that contain PCE can release vapors which can be inhaled. PCE originating from product spills can expose individuals to skin contact (liquid) or inhalation (vapor). PCE in soils can infiltrate buildings and result in inhalation of contaminated vapors. PCE can be ingested as a result of drinking contaminated water. Because of the high vapor pressure (essentially the ease that it evaporates) of PCE, much of it that enters into the environment exists as a vapor in the air, where it can then be broken down by sunlight, or brought back to the land surface by rain. Liquid PCE is denser than water, and has a limited tendency to mix with, or dissolve in, water. 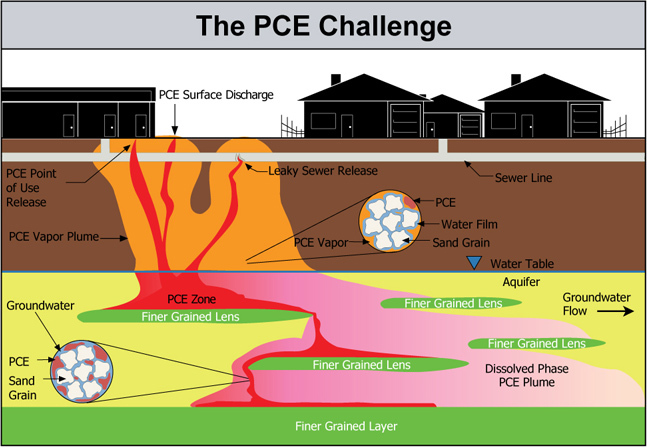 As a result, liquid PCE tends to move downward and can exist in groundwater as a separate dense non-aqueous phase liquid (or DNAPL) that will collect or pool at or along low points. Small amounts of PCE can dissolve in surface water or groundwater. Under certain conditions in soil and/or groundwater, naturally-occurring microorganisms can break down PCE. In the Truckee Meadows, the groundwater system is oxygenated and the conditions needed for the natural breakdown of PCE are generally absent. PCE was used extensively in the central Truckee Meadows from the 1940s into the 1980s. During this time, regulations governing PCE use and disposal were essentially non-existent. Early regulations (enacted in the late 70s) were less strict than they are today. 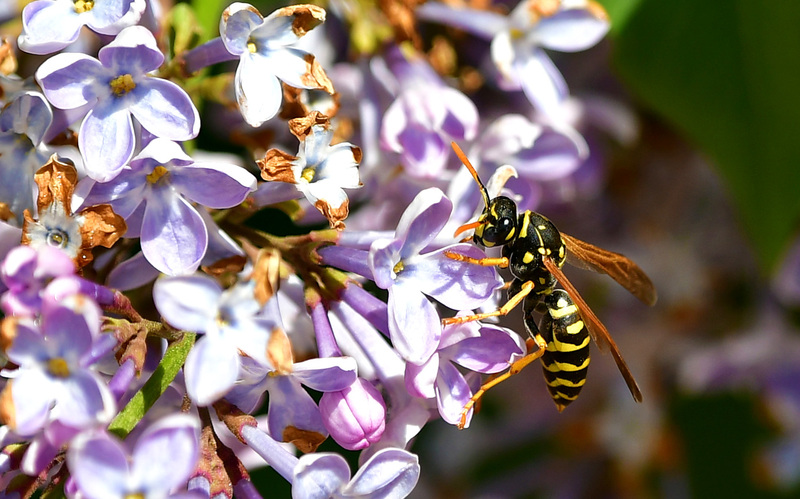 As a result, PCE use and disposal practices resulted in releases to the environment, and ultimately to contamination of the Truckee Meadows aquifer system. The majority of the PCE contamination in the central Truckee Meadows aquifer system has come from historical sources and past practices. In the 1980s, the U.S. Environmental Protection Agency (EPA) identified PCE as a possible human carcinogen and required municipal water systems nationwide to initiate systematic monitoring for PCE. Locally, the first sampling for drinking water wells in 1987 showed five of the municipal water supply wells in the central Truckee Meadows had PCE concentrations exceeding the then-proposed drinking water quality standard of 5 micrograms per liter (µg/L). This was significant because these wells are vital components of the local water supply system. Studies to identify the source of the groundwater PCE contamination, funded by the Nevada Division of Environmental Protection (NDEP) and completed in 1994, concluded the PCE contamination impacting municipal water supply wells in the central Truckee Meadows was widespread and likely to have originated from multiple sources over time. In the downtown Reno area alone, 320 individual businesses (including dry cleaners, automobile repair and paint shops, and gasoline service stations) were identified as potential sources for the PCE contamination. Many of these businesses had been closed for years. Addressing the numerous potential sources of PCE contamination in the central Truckee Meadows would require a significant level of intensive field investigation and possible site remediation. While funds to control contamination and eliminate ongoing releases could be recovered through enforcement actions by NDEP in accordance with existing state environmental regulations, mechanisms and funding (aside from a possible federal Superfund listing by the EPA) to address and mitigate groundwater impacted by historical PCE contamination from multiple potential sources, did not exist at that time.